For other uses, see Sarah Vaughan (disambiguation). Vaughan's father, Asbury "Jake" Vaughan, was a carpenter by trade and played guitar and piano. Her mother, Ada Vaughan, was a laundress who sang in the church choir. The Vaughans lived in a house on Brunswick Street in Newark for Vaughan's entire childhood. Jake was deeply religious. The family was active in New Mount Zion Baptist Church at 186 Thomas Street. Vaughan began piano lessons at age 7, sang in the church choir, and played piano for rehearsals and services. She developed an early love for popular music on records and the radio. In the 1930s, she frequently saw local and touring bands at the Montgomery Street Skating Rink. By her mid-teens, she began venturing illegally into Newark's night clubs and performing as a pianist and singer at the Piccadilly Club and the Newark Airport. Vaughan attended East Side High School, then transferred to Newark Arts High School, which opened in 1931. As her nocturnal adventures as a performer overwhelmed her academic pursuits, she dropped out of high school during her junior year to concentrate on music. Vaughan was frequently accompanied by a friend, Doris Robinson, on her trips into New York City. In the fall of 1942, by which time she was 18 years old, Vaughan suggested that Robinson enter the Apollo Theater Amateur Night contest. Vaughan played piano accompaniment for Robinson, who won second prize. Vaughan later decided to go back and compete as a singer herself. She sang "Body and Soul", and won—although the date of this victorious performance is uncertain. The prize, as Vaughan recalled to Marian McPartland, was $10 and the promise of a week's engagement at the Apollo. On November 20, 1942, she returned to the Apollo to open for Ella Fitzgerald. During her week of performances at the Apollo, Vaughan was introduced to bandleader and pianist Earl Hines, although the details of that introduction are disputed. Billy Eckstine, Hines' singer at the time, has been credited by Vaughan and others with hearing her at the Apollo and recommending her to Hines. Hines claimed later to have discovered her himself and offered her a job on the spot. After a brief tryout at the Apollo, Hines replaced his female singer with Vaughan on April 4, 1943. Vaughan spent the remainder of 1943 and part of 1944 touring the country with the Earl Hines big band, which featured Billy Eckstine. She was hired as a pianist so Hines could hire her under the jurisdiction of the musicians' union (American Federation of Musicians) rather than the singers union (American Guild of Variety Artists). But after Cliff Smalls joined the band as a trombonist and pianist, her duties were limited to singing. The Earl Hines band in this period is remembered as an incubator of bebop, as it included trumpeter Dizzy Gillespie, saxophonist Charlie Parker (playing tenor saxophone rather than alto), and trombonist Bennie Green. Gillespie arranged for the band, although the contemporary recording ban by the musicians' union meant that no commercial recordings exist. Eckstine quit the Hines band in late 1943 and formed a big band with Gillespie, leaving Hines to become the band's musical director. Parker joined Eckstine, and over the next few years the band included Gene Ammons, Art Blakey, Miles Davis, Kenny Dorham, Dexter Gordon, and Lucky Thompson. Vaughan accepted Eckstine's invitation to join his band in 1944, giving her the opportunity to record for the first time on December 5, 1944 on the song. "I'll Wait and Pray" for De Luxe. Critic and producer Leonard Feather asked her to record later that month for Continental with a septet that included Dizzy Gillespie and Georgie Auld. She left the Eckstine band in late 1944 to pursue a solo career, although she remained close to Eckstine and recorded with him frequently. Pianist John Malachi is credited with giving Vaughan the moniker "Sassy", a nickname that matched her personality. She liked it, and the name and its shortened variant "Sass" stuck with colleagues and the press. In written communications, Vaughan often spelled it "Sassie". Vaughan began her solo career in 1945 by freelancing on 52nd Street in New York City at the Three Deuces, the Famous Door, the Downbeat, and the Onyx Club. She spent time at Braddock Grill next to the Apollo Theater in Harlem. On May 11, 1945, she recorded "Lover Man" for Guild with a quintet featuring Gillespie and Parker with Al Haig on piano, Curly Russell on double bass, and Sid Catlett on drums. Later that month, she went into the studio with a slightly different and larger Gillespie/Parker aggregation and recorded three more sides. After being invited by violinist Stuff Smith to record the song "Time and Again" in October, Vaughan was offered a contract to record for Musicraft by owner Albert Marx, although she would not begin recording as a leader for Musicraft until May 7, 1946. In the intervening time, she recorded for Crown and Gotham and began performing regularly at Café Society Downtown, an integrated club in New York's Sheridan Square. While at Café Society, Vaughan became friends with trumpeter George Treadwell, who became her manager. She delegated to him most of the musical director responsibilities for her recording sessions, allowing her to concentrate on singing. Over the next few years, Treadwell made changes in Vaughan's stage appearance. Aside from a new wardrobe and hair style, she had her teeth capped, eliminating a gap between her two front teeth. Her recordings for Musicraft included "If You Could See Me Now" (written and arranged by Tadd Dameron), "Don't Blame Me", "I've Got a Crush on You", "Everything I Have Is Yours" and "Body and Soul". With Vaughan and Treadwell's professional relationship on solid footing, the couple married on September 16, 1946. Vaughan's recording success for Musicraft continued through 1947 and 1948. Her recording of "Tenderly"—she was proud to be the first to have recorded that jazz standard—became an unexpected pop hit in late 1947. Her December 27, 1947, recording of "It's Magic" (from the Doris Day film Romance on the High Seas) found chart success in early 1948. Her recording of "Nature Boy" from April 8, 1948, became a hit around the time the popular Nat King Cole version was released. Because of a second recording ban by the musicians' union, "Nature Boy" was recorded with an a cappella choir. The musicians' union ban pushed Musicraft to the brink of bankruptcy. Vaughan used the missed royalty payments as an opportunity to sign with the larger Columbia record label. After the settling of legal issues, her chart successes continued with "Black Coffee" in the summer of 1949. While at Columbia through 1953, she was steered almost exclusively to commercial pop ballads, several with success on the charts: "That Lucky Old Sun", "Make Believe (You Are Glad When You're Sorry)", "I'm Crazy to Love You", "Our Very Own", "I Love the Guy", "Thinking of You" (with pianist Bud Powell), "I Cried for You", "These Things I Offer You", "Vanity", "I Ran All the Way Home", "Saint or Sinner", "My Tormented Heart", and "Time". She won Esquire magazine's New Star Award for 1947, awards from Down Beat magazine from 1947 to 1952, and from Metronome magazine from 1948 to 1953. Recording and critical success led to performing opportunities, with Vaughan singing to large crowds in clubs around the country during the late 1940s and early 1950s. In the summer of 1949, she made her first appearance with a symphony orchestra in a benefit for the Philadelphia Orchestra entitled "100 Men and a Girl." Around this time, Chicago disk jockey Dave Garroway coined a second nickname for her, "The Divine One", that would follow her throughout her career. One of her early television appearances was on DuMont's variety show Stars on Parade (1953–54) in which she sang "My Funny Valentine" and "Linger Awhile". In 1949, with their finances improving, Vaughan and Treadwell bought a three-story house on 21 Avon Avenue in Newark, occupying the top floor during their increasingly rare off-hours at home and moving Vaughan's parents to the lower two floors. However, business pressures and personality conflicts led to a cooling in Treadwell and Vaughan's relationship. Treadwell hired a road manager to handle her touring needs and opened a management office in Manhattan so he could work with other clients. Vaughan's relationship with Columbia soured as she became dissatisfied with the commercial material and its lackluster financial success. She made some small-group recordings in 1950 with Miles Davis and Bennie Green, but they were atypical of what she recorded for Columbia. In 1949, Vaughan had a radio program, Songs by Sarah Vaughan, on WMGM in New York City. The fifteen-minute shows were broadcast in the evenings on Wednesday through Sunday from The Clique Club, described as "rendezvous of the bebop crowd." She was accompanied by George Shearing on piano, Oscar Pettiford on double bass, and Kenny Clarke on drums. In 1953, Treadwell negotiated a contract for Vaughan with Mercury in which she would record commercial material for Mercury and jazz-oriented material for its subsidiary, EmArcy. She was paired with producer Bob Shad, and their working relationship yielded commercial and artistic success. Her debut recording session at Mercury took place in February 1954. She remained with Mercury through 1959. After recording for Roulette from 1960 to 1963, she returned to Mercury from 1964 to 1967. Her commercial success at Mercury began with the 1954 hit "Make Yourself Comfortable", recorded in the fall of 1954, and continued with "How Important Can It Be" (with Count Basie), "Whatever Lola Wants", "The Banana Boat Song", "You Ought to Have a Wife", and "Misty". Her commercial success peaked in 1959 with "Broken Hearted Melody", a song she considered "corny" which nevertheless became her first gold record, and a regular part of her concert repertoire for years to come. Vaughan was reunited with Billy Eckstine for a series of duet recordings in 1957 that yielded the hit "Passing Strangers". Her commercial recordings were handled by a number of arrangers and conductors, primarily Hugo Peretti and Hal Mooney. The jazz "track" of her recording career proceeded apace, backed either by her working trio or combinations of jazz musicians. One of her favorite albums was a 1954 sextet date that included Clifford Brown. In the latter half of the 1950s she followed a schedule of almost non-stop touring. She was featured at the first Newport Jazz Festival in the summer of 1954 and starred in subsequent editions of that festival at Newport and in New York City for the remainder of her life. In the fall of 1954, she performed at Carnegie Hall with the Count Basie Orchestra on a bill that also included Billie Holiday, Charlie Parker, Lester Young and the Modern Jazz Quartet. That fall, she again toured Europe before embarking on a "Big Show" U.S. tour, a succession of performances that included Count Basie, George Shearing, Erroll Garner and Jimmy Rushing. At the 1955 New York Jazz Festival on Randalls Island, Vaughan shared the bill with the Dave Brubeck quartet, Horace Silver, Jimmy Smith, and the Johnny Richards Orchestra. The exit of Treadwell from Vaughan's life was precipitated by the entry of Clyde "C.B." Atkins, a man of uncertain background whom she had met in Chicago and married on September 4, 1959. Although Atkins had no experience in artist management or music, Vaughan wished to have a mixed professional and personal relationship like the one she had with Treadwell. She made Atkins her manager, although she was still feeling the sting of the problems she had with Treadwell and initially kept a closer eye on Atkins. Vaughan and Atkins moved into a house in Englewood, New Jersey. When Vaughan's contract with Mercury ended in late 1959, she signed on with Roulette, a small label owned by Morris Levy, who was one of the backers of Birdland, where she frequently appeared. She began recording for Roulette in April 1960, making a string of large ensemble albums arranged or conducted by Billy May, Jimmy Jones, Joe Reisman, Quincy Jones, Benny Carter, Lalo Schifrin, and Gerald Wilson. She had pop chart success in 1960 with "Serenata" on Roulette and "Eternally" and "You're My Baby", a couple of residual tracks from her Mercury contract. She recorded After Hours (1961) with guitarist Mundell Lowe and double bassist George Duvivier and Sarah + 2 (1962) with guitarist Barney Kessel and double bassist Joe Comfort. In 1961 Vaughan and Atkins adopted a daughter, Deborah Lois Atkins, known professionally as Paris Vaughan. However, the relationship with Atkins proved difficult and violent. After several incidents, she filed for divorce in November 1963. She turned to two friends to help sort out the financial affairs of the marriage. Club owner John "Preacher" Wells, a childhood acquaintance, and Clyde "Pumpkin" Golden Jr. discovered that Atkins' gambling and spending had put Vaughan around $150,000 in debt. The Englewood house was seized by the IRS for nonpayment of taxes. Vaughan retained custody of their child and Golden took Atkins' place as Vaughan's manager and lover for the remainder of the decade. When her contract with Roulette ended in 1963, Vaughan returned to the more familiar confines of Mercury. In the summer of 1963, she went to Denmark with producer Quincy Jones to record Sassy Swings the Tivoli, an album of live performances with her trio. During the next year, she made her first appearance at White House for President Lyndon Johnson. The Tivoli recording would be the brightest moment of her second stint with Mercury. Changing demographics and tastes in the 1960s left jazz musicians with shrinking audiences and inappropriate material. Although she retained a following large and loyal enough to maintain her career, the quality and quantity of her recorded output dwindled as her voice darkened and her skill remained undiminished. At the conclusion of her Mercury deal in 1967, she lacked a recording contract for the remainder of the decade. 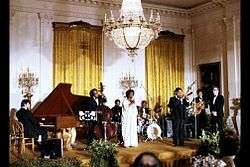 Dizzy Gillespie and Sarah Vaughan perform at the White House in honor of the Shah of Iran on November 15, 1977. In the summer of 1980 she received a plaque on 52nd Street outside the CBS Building (Black Rock) commemorating the jazz clubs she had once frequented on "Swing Street" and which had long since been replaced with office buildings. A performance of her symphonic Gershwin program with the New Jersey Symphony in 1980 was broadcast on PBS and won her an Emmy Award the next year for Individual Achievement, Special Class. She was reunited in 1982 with Tilson Thomas for a modified version of the Gershwin program, played again by the Los Angeles Philharmonic but this time in its home hall, the Dorothy Chandler Pavilion; the CBS recording of the concert Gershwin Live! won a Grammy for Best Jazz Vocal Performance, Female. After the end of her contract with Pablo in 1982, she committed to a limited number of studio recordings. She made a guest appearance in 1984 on Barry Manilow's 2:00 AM Paradise Cafe, an album of pastiche compositions with established jazz musicians. In 1984, she participated in The Planet is Alive, Let It Live a symphonic piece composed by Tito Fontana and Sante Palumbo on Italian translations of Polish poems by Karol Wojtyla, better known as Pope John Paul II. The recording was made in Germany with an English translation by writer Gene Lees and was released by Lees on his private label after the recording was rejected by the major labels. In 1986, she sang "Happy Talk" and "Bali Ha'i" in the role of Bloody Mary on a studio recording by Kiri Te Kanawa and José Carreras of the score of the Broadway musical South Pacific, while sitting on the studio floor. Vaughan's final album was Brazilian Romance, produced by Sérgio Mendes with songs by Milton Nascimento and Dori Caymmi. It was recorded primarily in the early part of 1987 in New York and Detroit. In 1988, she contributed vocals to an album of Christmas carols recorded by the Mormon Tabernacle Choir with the Utah Symphony Orchestra and sold in Hallmark Cards stores. In 1989, Quincy Jones' album Back on the Block included Vaughan in a brief scatting duet with Ella Fitzgerald. This was her final studio recording. It was her only studio recording with Fitzgerald in a career that had begun 46 years earlier opening for Fitzgerald at the Apollo. The video Sarah Vaughan Live from Monterey was taped in 1983 or 1984 with her trio and guest soloists. Sass and Brass was taped in 1986 in New Orleans with guests Dizzy Gillespie and Maynard Ferguson. Sarah Vaughan: The Divine One was part of the American Masters series on PBS. Also in 1986, on Independence Day in a program nationally televised on PBS she performed with the National Symphony Orchestra conducted by Mstislav Rostropovich, in a medley of songs composed by George Gershwin. In 1989, Vaughan's health began to decline, although she rarely revealed any hints of this in her performances. She canceled a series of engagements in Europe in 1989, citing the need to seek treatment for arthritis of the hand, although she was able to complete a series of performances in Japan. During a run at New York's Blue Note Jazz Club in 1989, she was diagnosed with lung cancer and was too ill to finish the last day of what would turn out to be her final series of public performances. Vaughan returned to her home in California to begin chemotherapy and spent her final months alternating stays in the hospital and at home. She grew weary of the struggle and demanded to be taken home, where at the age of 66 she died on the evening of April 3, 1990, while watching a television movie featuring her daughter. Her funeral was held at Mount Zion Baptist Church, 208 Broadway in Newark, New Jersey. Following the ceremony, a horse-drawn carriage transported her body to Glendale Cemetery, Bloomfield in New Jersey. Parallels have been drawn between Vaughan's voice and that of opera singers. Jazz singer Betty Carter said that with training Vaughan could have "...gone as far as Leontyne Price." Bob James, Vaughan's musical director in the 1960s said that "...the instrument was there. But the knowledge, the legitimacy of that whole world were not for her ... But if the aria were in Sarah's range she could bring something to it that a classically trained singer could not." 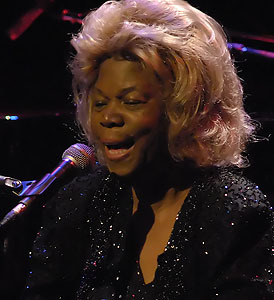 In a chapter devoted to Vaughan in his book Visions of Jazz (2000), critic Gary Giddins described her as the "...ageless voice of modern jazz – of giddy postwar virtuosity, biting wit and fearless caprice". He concluded by saying that "No matter how closely we dissect the particulars of her talent ... we must inevitably end up contemplating in silent awe the most phenomenal of her attributes, the one she was handed at birth, the voice that happens once in a lifetime, perhaps once in several lifetimes." Her obituary in The New York Times described her as a "singer who brought an operatic splendor to her performances of popular standards and jazz." Jazz singer Mel Tormé said that she had "...the single best vocal instrument of any singer working in the popular field." Her ability was envied by Frank Sinatra who said, "Sassy is so good now that when I listen to her I want to cut my wrists with a dull razor." New York Times critic John S. Wilson said in 1957 that she possessed "what may well be the finest voice ever applied to jazz." It was close to its peak until shortly before her death at the age of 66. Late in life she retained a "youthful suppleness and remarkably luscious timbre" and was capable of the projection of coloratura passages described as "delicate and ringingly high". Vaughan had a large vocal range of soprano through a female baritone, exceptional body, volume, a variety of vocal textures, and superb and highly personal vocal control. Her ear and sense of pitch were almost perfect, and there were no difficult intervals. In her later years her voice was described as a "burnished contralto" and as her voice deepened with age her lower register was described as having "shades from a gruff baritone into a rich, juicy contralto". Her use of her contralto register was likened to "dipping into a deep, mysterious well to scoop up a trove of buried riches." Musicologist Henry Pleasants noted, "Vaughan who sings easily down to a contralto low D, ascends to a pure and accurate [soprano] high C."
She held a microphone in live performance, using its placement as part of her performance. Her placings of the microphone allowed her to complement her volume and vocal texture, often holding the microphone at arms length and moving it to alter her volume. She frequently used the song "Send in the Clowns" to demonstrate her vocal abilities in live performance. The performance was called a "three-octave tour de force of semi-improvisational pyrotechnics in which the jazz, pop and operatic sides of her musical personality came together and found complete expression" by The New York Times. Singers influenced by Vaughan include Phoebe Snow, Anita Baker, Sade, and Rickie Lee Jones. Singers Carmen McRae and Dianne Reeves both recorded tribute albums to Vaughan following her death; Sarah: Dedicated to You (1991) and The Calling: Celebrating Sarah Vaughan (2001) respectively. I don't know why people call me a jazz singer, though I guess people associate me with jazz because I was raised in it, from way back. I'm not putting jazz down, but I'm not a jazz singer ... I've recorded all kinds of music, but (to them) I'm either a jazz singer or a blues singer. I can't sing a blues – just a right-out blues – but I can put the blues in whatever I sing. I might sing 'Send In the Clowns' and I might stick a little bluesy part in it, or any song. What I want to do, music-wise, is all kinds of music that I like, and I like all kinds of music. Vaughan was married three times: to George Treadwell (1946–1958), to Clyde Atkins (1958–1961), and to Waymon Reed (1978–1981). Unable to bear children, Vaughan adopted a baby girl (Debra Lois) in 1961. Debra worked in the 1980s and 1990s as an actress under the name Paris Vaughan. She was a member of the Zeta Phi Beta sorority. The album Sarah Vaughan with Clifford Brown and the single "If You Could See Me Now" were inducted into the Grammy Hall of Fame, an award established in 1973 to honor recordings that are at least twenty-five years old and have "qualitative or historical significance." In 1985 she received a star on the Hollywood Walk of Fame, and in 1988 she was inducted into the American Jazz Hall of Fame. In 1978, she was given an Honorary Doctorate of Music by Berklee College of Music. In 2012, she was inducted into the New Jersey Hall of Fame. In 2004–2006, New Jersey Transit paid tribute to Vaughan in the design of its Newark Light Rail stations. Passengers stopping at any station on this line can read the lyrics to "Body and Soul" along the edge of the station platform. 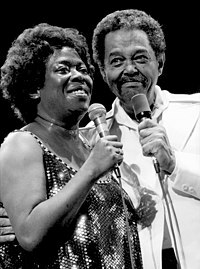 San Francisco and Berkeley, California, made March 27 Sarah Lois Vaughan Day. ^ Holden, Stephen (April 5, 1990). "Sarah Vaughan, 'Divine One' Of Jazz Singing, Is Dead at 66". The New York Times. Retrieved September 27, 2018. ^ "Entertainment Awards Database". theenvelope.latimes.com. November 11, 2008. Retrieved November 3, 2011. ^ "Sarah Vaughan". NEA. January 24, 2013. Retrieved September 27, 2018. ^ Yanow, Scott. "Sarah Vaughan". AllMusic. Retrieved September 27, 2018. ^ Gates, Henry Louis; West, Cornel (February 5, 2002). The African-American Century: How Black Americans Have Shaped Our Country. Simon and Schuster. ^ a b c d e f Gourse, Leslie (August 5, 2009). Sassy: The Life Of Sarah Vaughan. Da Capo Press. ISBN 978-0-7867-5114-3. ^ a b c d e f g h i j k l m n Hayes, Elaine M. Queen of Bebop: The Musical Lives of Sarah Vaughan (1 ed.). Ecco/Harper Collins. pp. 29–32. ISBN 978-0-06-236468-5. ^ a b "Songs by Sarah Vaughan". Billboard. January 22, 1949. p. 9. Retrieved September 29, 2016. ^ Murrells, Joseph (1978). The Book of Golden Discs (2 ed.). London: Barrie and Jenkins. p. 120. ISBN 0-214-20512-6. ^ Scaduto, Anthony (April 10, 1990). "A Final Farewell To Sarah Vaughan". Newsday. Retrieved July 18, 2011. Two white horses, bedecked with black plumes over their ears, pulled the hearse a little over three miles to Glendale Cemetery in nearby Bloomfield. ^ Ian Carr; Digby Fairweather; Brian Priestley (2004). The Rough Guide to Jazz. Rough Guides. pp. 147–. ISBN 978-1-84353-256-9. Retrieved August 6, 2013. ^ a b Gary Giddins (May 18, 2000). Visions of Jazz: The First Century. Oxford University Press. pp. 307–. ISBN 978-0-19-513241-0. Retrieved August 6, 2013. ^ a b c d e f Holden, Stephen (April 5, 1990). 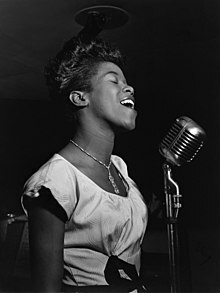 "Sarah Vaughan, 'Divine One' Of Jazz Singing, Is Dead at 66". The New York Times. p. 1. ^ a b Thompson, Thomas (June 16, 1972). "Almost nobody's as classy as Sassy". Life. p. 27–. ISSN 0024-3019. ^ a b c d e Martin Williams (November 11, 1992). The Jazz Tradition. Oxford University Press. pp. 211–. ISBN 978-0-19-536017-2. Retrieved August 6, 2013. ^ Pleasants, Henry. The great American popular singers. Simon and Schuster. ISBN 978-0671540999. ^ "ΖΦΒ Heritage :: Notable Zetas". Zphib1920.org. Archived from the original on January 9, 2012. Retrieved November 1, 2011. ^ "Grammy Hall of Fame". GRAMMY.org. Retrieved November 3, 2011. ^ "Honorary Degree Recipients". www.berklee.edu. Retrieved September 27, 2018. ^ "Sarah Vaughan". New Jersey Hall of Fame. April 14, 2014. Retrieved September 27, 2018. ^ "Newark, New Jersey Light Rail/City Subway". www.nycsubway.org. Retrieved September 27, 2018. ^ "Student Alumni Association | UCLA Alumni". Uclalumni.net. Retrieved November 3, 2011. ^ Riley, Ricky (April 2, 2016). "Jazz Legend Sarah Vaughan Joins Other Black Music Greats with Commemorative Stamp". Atlanta Black Star. Retrieved September 27, 2018. 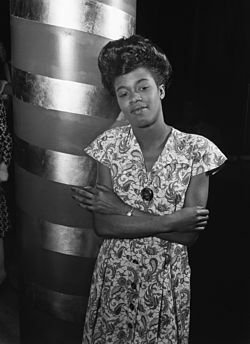 Wikimedia Commons has media related to Sarah Vaughan. William Clarence Eckstine was an American jazz and pop singer, and a bandleader of the swing era. He was noted for his rich, resonant, almost operatic bass-baritone voice. Eckstine's recording of "I Apologize" was awarded the Grammy Hall of Fame Award in 1999. The New York Times described him as an "influential band leader" whose "suave bass-baritone" and "full-throated, sugary approach to popular songs inspired singers like Joe Williams, Arthur Prysock and Lou Rawls." Shirley Valerie Horn was an American jazz singer and pianist. She collaborated with many jazz greats including Miles Davis, Dizzy Gillespie, Toots Thielemans, Ron Carter, Carmen McRae, Wynton Marsalis and others. She was most noted for her ability to accompany herself with nearly incomparable independence and ability on the piano while singing, something described by arranger Johnny Mandel as "like having two heads", and for her rich, lush voice, a smoky contralto, which was described by noted producer and arranger Quincy Jones as "like clothing, as she seduces you with her voice". Ernestine Anderson was an American jazz and blues singer. In a career spanning more than six decades, she recorded over 30 albums. She was nominated four times for a Grammy Award. She sang at Carnegie Hall, the Kennedy Center, the Monterey Jazz Festival, as well as at jazz festivals all over the world. In the early 1990s she joined Qwest Records, the label of fellow Garfield High School grad Quincy Jones. Crazy and Mixed Up is a 1982 studio album by the American jazz singer Sarah Vaughan. Songs of the Beatles is a 1981 album by Sarah Vaughan of songs by The Beatles. Walter Gross is best known for having composed the music for the popular 1946 song "Tenderly". In addition to composing dozens of other titles, he was also a pianist, arranger, orchestra leader, and record industry executive. Sarah Vaughan and Billy Eckstine Sing the Best of Irving Berlin is a 1957 studio album featuring Billy Eckstine and Sarah Vaughan, and the songs of Irving Berlin. Sarah Vaughan, sometimes incorrectly referred to as Sarah Vaughan with Clifford Brown, is a 1954 jazz album featuring Grammy Award winning singer Sarah Vaughan and influential trumpeter Clifford Brown, released on the EmArcy label. It was the only collaboration between the pair. Well received, though not without some criticism, the album was Vaughan's own favorite among her works through 1980. The album was inducted into the Grammy Hall of Fame in 1999. The Calling: Celebrating Sarah Vaughan is a 2001 studio album by Dianne Reeves, recorded in tribute to Sarah Vaughan and mostly featuring songs closely identified with the great singer. In the liner notes, Reeves wrote, "Making this CD is the fulfillment of a dream born when I first heard Sarah Vaughan as a teenager. The dream continued to grow as I marveled at her magical touch with lyrics, melodies, harmonies and timbre. ... She fearlessly explored unfamiliar areas in the realm of vocal musical expression, reaching, ascending, grasping and possessing. Sarah was never content to luxuriate in her past laurels, but her musical appetite propelled her forward throughout her career. She never deserted her calling." Reeves also mentions that her first Vaughan album was Sarah Vaughan with Michel Legrand and tells of how she met Vaughan at a 1975 tribute concert for Cannonball Adderley. She told a woman she was speaking with that she loved Vaughan, not realizing that the woman was Vaughan herself.